Where was this type of reinforcement when I was a kid? 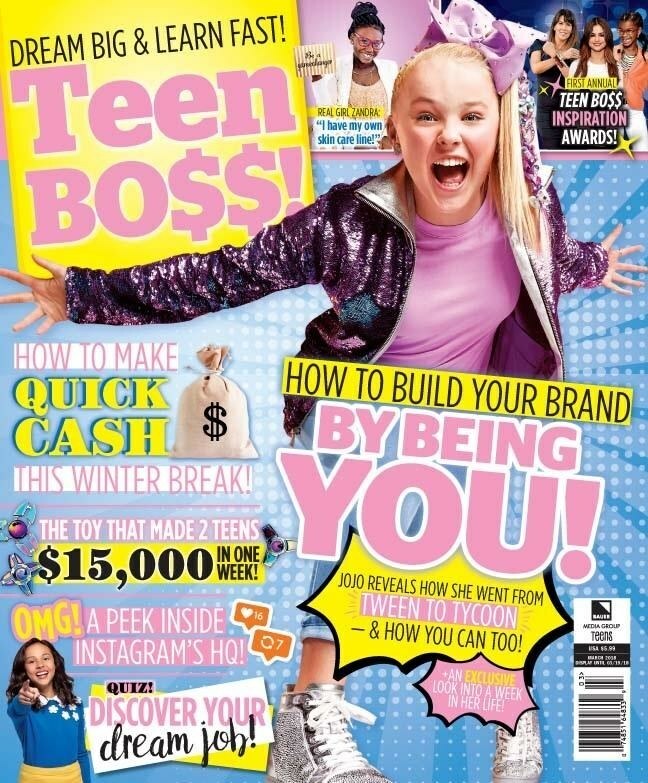 The children in that magazine cover terrify me, but I had tons of ideas that could've made money when I was their age. I was too dumb to capitalize on my own sales abilities. Now there's skin care products! Makeup tutorials! Toy unboxing videos! Video game let's plays! Clothing lines! Hair bows! (Hair bows?) Kids and teens are able to retire before they even start high school. Eight year olds are selling themselves on YouTube and Instagram, and they are succeeding. Not sell themselves. Not t h a t way. But they are, in effect, selling themselves -- their privacy, their stories. It strikes me as odd that it's about selling yourself. Everything is branded. In my day (*shakes finger pointedly*), that made you a sellout. In this gig economy of selling individual skills and services, there can never be too much self-promotion. Children are taught that it's best to start young and that everybody has something to offer. That's why I have so much trouble with this website. What is it? What am I trying to do? It's an engine for my work. What would I have done with that kind of positive reinforcement when I was younger? If there were a magazine dedicated to my financial success? How many things would I have made, knowing that it was possible for me to succeed simply because others already had? What makeup lines would I have created? What YouTube television show would I have written? There are just so many more opportunities now for kids who are willing to hustle. I didn't even know musical.ly existed and had created actual teenaged pop stars. Celebrities! People who are recognized and asked for autographs, vaulted to fame by an app! YouTube celebrities are more recognizable than movie celebrities to those in that coveted 18-24 age bracket. It is so much more common for people to have their fingers stuck in multiple pies. That used to be a Holden Caulfield-esque "phony" way to capitalize on success, and if Generation X hated anything, they hated sellouts. If an artist used his images to make T-shirts, that used to qualify as "selling out" because the art no longer existed independent of financial gain. As Gawker said, today there is "no longer a penalty." Now it's just good business. If you don't cross-sell, then you're an idiot who lost money. Holding onto your own coattails and launching yourself from industry to industry is not always a bad thing. It's not always Kanye West saying he'll be the best clothing designer in the history of ever and then selling us white undershirts for $120 (which sold out, and I hope you purchasers are ashamed of yourselves). Conversely, this is also how we get good evil geniuses like Elon Musk, whose ability to learn and make change is elevated to an art form. It always comes back to legacies with me. What is my legacy going to be? What will I leave behind when I pass from this mortal coil? Is it going to be good enough, or impactful enough, or worth anyone's time? What will carry my name? When I reach the end of my life and look back at my cumulative CV, what am I going to find? And if I'd started at 15, or 8, what difference would it have made? If I were a kid in today's weird world, what could I have done?